The Fall Color I Am Obsessed With This Year. Is there a Fall color you are obsessed with? I typically love Fall colors, but it’s not like I am obsessed with a specific color. I usually just naturally gravitate towards deeper neutral tones during the Fall months. But for some reason, this year I have a Fall color obsession and that color is rust. I guess rust can be a more burnt orange or a rustic red, whatever you want to call it, that is the color I can’t get enough of! 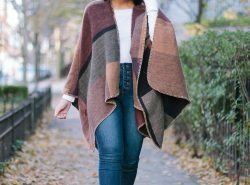 During my blogging break, I was inspired to put together several Fall outfits. And guess what color I kept picking out, especially when it came to purchasing new clothes…. you guessed it, rust!! So I will warn you all now, I will probably have quite a few rust-colored Fall outfits. The weird part is, I always liked this color, but I was not this OBSESSED. I want sweaters, skirts, pants, blouses, jackets, etc in this color. I fell in love with this Who What Wear skirt because of the color. I think the color made the skirt look more chic and more luxurious. When in fact, I only spent $29.99. Score! When the temperature drops, I think I will pair it with some suede over the knee boots and a chunkier sweater. Oo yes, outfit idea for my Winter posts haha! If you don’t know this, Who What Wear is the BEST Target collection ever. I always get excited when they have new pieces come out! Speaking of sweaters, my turtleneck is my new love. This is my first time trying this brand, and they did not disappoint. If there is anything I think a woman should splurge on it is a cashmere sweater. And go for the simple ones. They just elevate your outfit. So effortlessly chic and it feels so soft! It is a bit of a splurge, but I promise you, you will love it. You can get an extra 15% off by using the code REPEAT634. REPEAT Cashmere is a company based in Switzerland and they specialize in cashmere. Whenever I hear a company has a specialty, I know it is good. Pretty much because they can focus on perfecting one thing and REPEAT Cashmere definitely did. It wouldn’t be fair if I didn’t share other rust-colored pieces I am loving this Fall. Hope you love these pieces as much as I do! This is a beautiful color indeed! 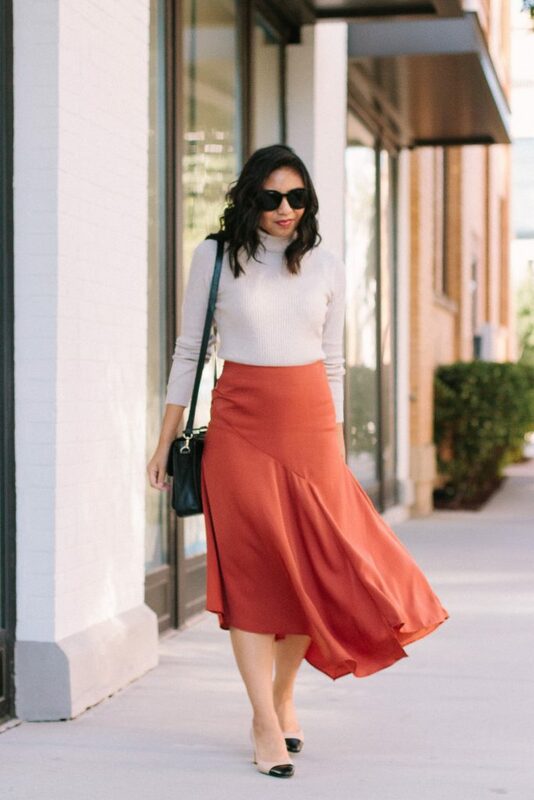 Perfect for this skirt and a great fall outfit! Such a pretty outfit! Love your skirt! 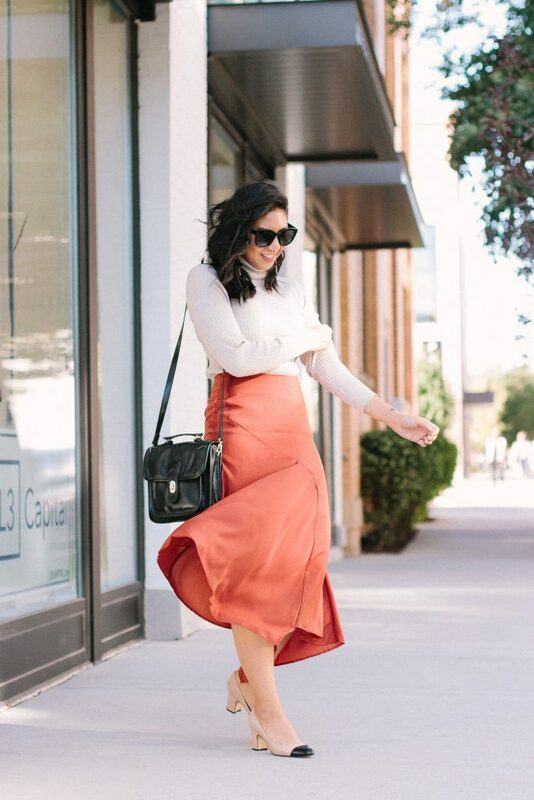 That skirt is perfection + rust is so perfect for this time of year. You look amazing – Happy Oct! 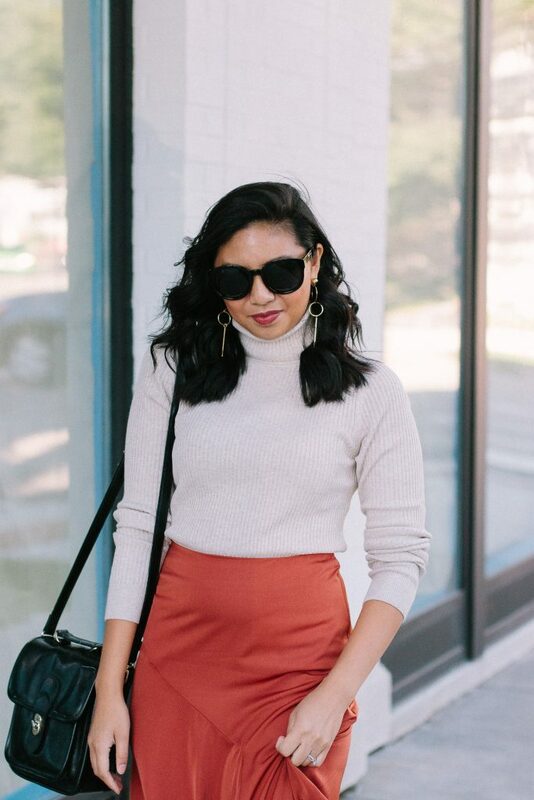 This is great outfit for fall. Love the color of skirt which is really amazing. Your photos are stunning. OMG this skirt is so beautiful ! I love this color sooo much. Wow, this skirt is so beautiful, I need such a skirt in my life. Thanks, honey for your comment but that was an old post. I request to check my newest one. I think a deep burgundy is the color I tend to gravitate to when the weather gets colder. I really love the rust color of your skirt though. It’s the perfect Fall color! Deep burgundy is also a gorgeous color! This outfit is so pretty and just screams fall! I am loving rust color for this season, it’s such a great color! This color is so pretty and I love your skirt! That faux fur coat you’re showing is really cute too!! 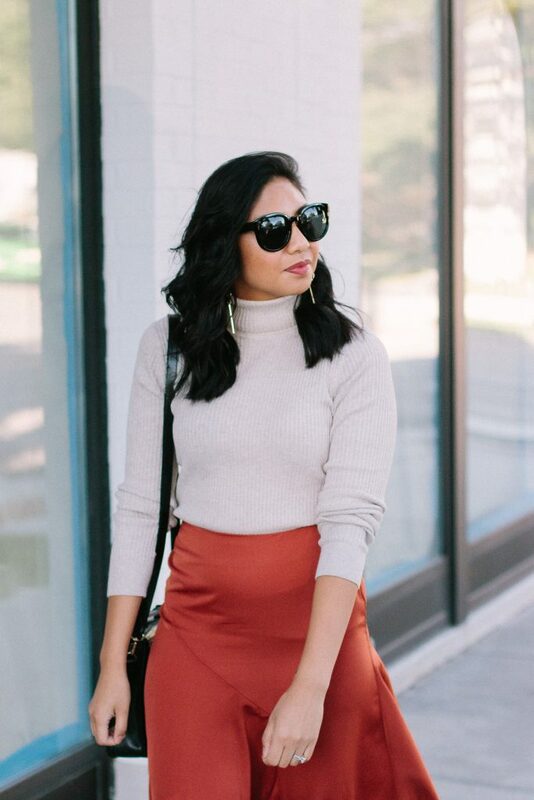 My re-obsession with rust started last summer and I had to have all the pieces for fall! 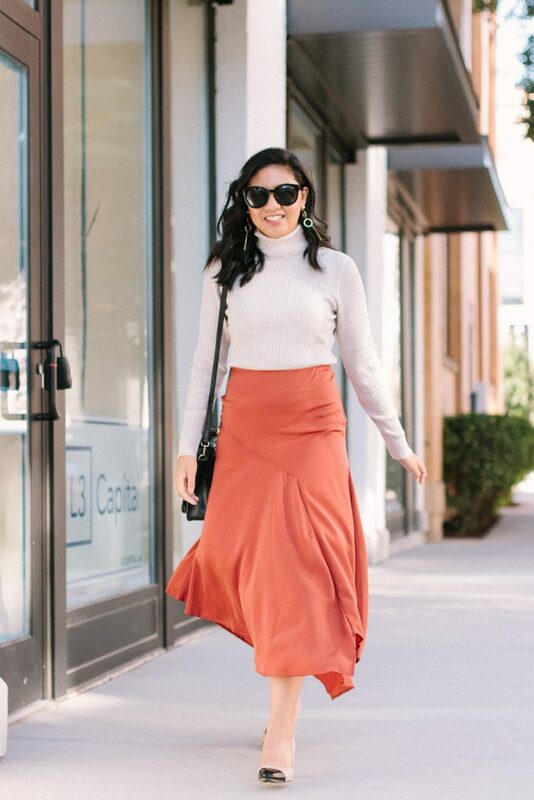 Dress, sweater, blazer, jumpsuit… This skirt is gorgeous, and I’m so happy rust is having it’s moment. It’s such a pretty color! I’m happy too haha! Thank you Lydia! Your skirt is amazing. I really like how it looks like and color is so gorgeous because I’m also big fan of rust color during fall season. omg yes! I am weirdly into orange too these days and I’m wearing a mustard yellow mock neck today! I’ve also been wearing a lot of forest green. It’s been a very experimentative fall for me so far! Right?! It’s so good! Oo yes to forest green too! You are so right- rust is such a pretty, cozy fall color! That skirt is indeed gorgeous because of the color and the fabric and I love the color combination of the entire outfit. The bag is cute too. Have a blessed Week. Love, Love, Love this color for Fall as well! Such a great shade, and I am loving this skirt! I barely had in my wardrobe until this Fall! And then I became obsessed haha! Alright, I’m hooked! This entire outfit needs to be in my closet right away. I cannot get enough of that rusty color – and it’s especially so stunning on you! Yay!! The color would look great on you too! Oh my goodness!!! I am in love with the entire outfit! 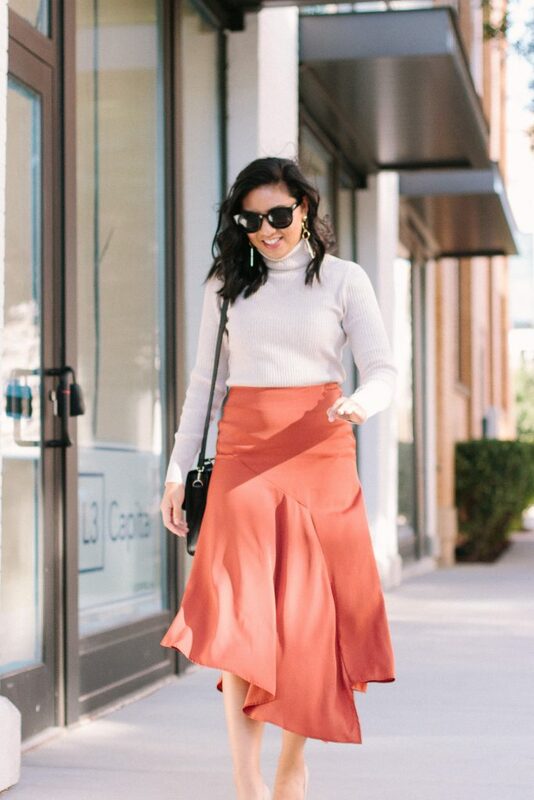 I LOVE the skirt and the sweater you paired with it! Thank you so much Inna! This whole outfit is amazing but that skirt!! SO cute and such a great price! This has got to be the prettiest skirt I’ve seen today. So chic and sassy, really perfect on you dear! I am RIGHT on that rust train with ya. Absolutely love this skirt..what a good Target find! Rust is such a great color! I am really into this color right now too! I just got a Madewell top in this shade! It’s such a good color! Thank you so much Azanique!